Let’s clink glasses with fresh grape juice! Do you love grapes both raw and in the form of white or red wine? And have you ever tried fresh grape juice? If not, it’s high time you did it! Grapes are having their high season right now, so take advantage of it and enjoy nicely sweet taste, which you won’t get in any other time of the year. Grapevine is mainly grown to produce wine, but grapes belong to the healthiest fruits, so it’s a huge pity not to consume them in a raw form. They contain a lot of important vitamins and minerals including a very effective antioxidant resveratrol. And what are the wholesome effects of grapes on your organism? Majority of precious substances is lost after processing grapes into wine. According to scientists, wine has also many wholesome effects on your body, but there’s alcohol, which spoils everything if you drink in higher volumes. It pollutes your liver and other body organs and can have a very harmful impact. Ripe grapes have strong natural sweet taste and their juice is healthy and delicious. Prepare it for your children instead of artificially sweetened lemonades. They will love it and moreover, you strengthen their immunity system! 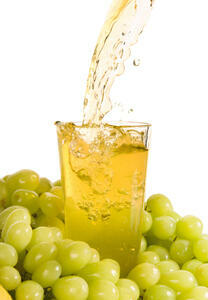 Grapes are also very good to add into your favorite vegetable juices or as a supplement for your original recipes. So, get inspired! Everybody loves the taste of fresh grape juice. Let’s serve it in wine glasses, maybe you realize that non-alcoholic wine from your juicer tastes better than the one from wine cellars.